Dear Muriel Morris Gardiner Buttinger: Who was the real “Julia?” That is the question. When the 1977 movie “Julia,” came out about a young heiress involved in the Austrian underground, in which American author Lillian Hellman claimed the story as her own, you were a woman determined to set the record straight and rightfully did so saying, “The film distorted history.” Muriel realized that the similarities between her wartime exploits and the Julia film version were remarkably similar. 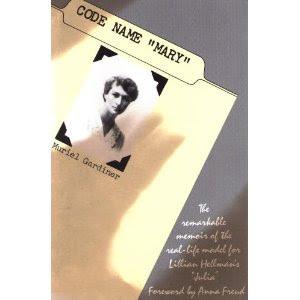 The release of the movie prompted Muriel to record her own story, “Code Name ‘Mary’: Memoirs of an American Woman in the Austrian Underground, which depicts her heroic role in war torn Europe in the 1930’s. The daughter of Edward Morris (the meat-packing magnate and president of the Morris & Company) and Helen Swift (a member of the family which owned Swift & Company) Muriel Morris was born on November 23, 1901 into a Chicago family of great social position. Although it gave her enormous wealth, privilege and opportunities Muriel was uncomfortable with her wealth and gave away money to the needy and gifts to friends. As a young heiress she became aware of the plight of the poor and developed a lifelong commitment to social and political reform which planted the seeds of philanthropy. The seeds for social justice were forged when Muriel became a student at the University of Vienna Medical School in Vienna, Austria where she became an staunch activist. She later married Joseph Buttinger, leader of the Austrian Revolutionary Socialist movement. By 1934 Muriel became involved in anti-fascist activities and used her significant trust fund, and enormous courage to help Jews and others in danger by the Nazis, who would soon run Austria. Amidst great poverty and despair Muriel provided her home as a safe-house, smuggled false passports and provided money to help hundreds of Jews and political dissidents escape from Europe. When she graduated from medical school in 1938, she was forced out of Vienna by the Gestapo guards after writing that she was Jewish on her exit forms and a similar scene appears in the movie. However, during her sojourn in Europe she also forged a strong relationship with Anna Freud, daughter of the father of psychology, Sigmund Freud. When she returned to the United States Muriel continued in her role as benefactor and was active in aiding concentration camp refugees. She completed her medical internship and began work at the Trenton State hospital. She switched to psychoanalysis and worked for years as a therapist and adjunct professor at Rutgers University in New Brunswick. Dear Juliette: Who would ever have expected that during a time when women were restrained by society, that you would break out of the Victorian Age with its limits and social order to emerge as a woman determined to succeed, the founder of the Girl Scouts of the United States in 1912. Known as “Daisy” most of her life, Juliette Magill Kinzie Gordon was born on October 31, 1860, in Savannah, Georgia. Young Juliette spent an idealistic childhood in her large handsome English Regency house, the second of six children of William Washington Gordon and Eleanor Kinzie Gordon. However, her life was not devoid of a physical handicap and disappointment. Juliette had her own cross to bear and struggled with impaired hearing, which gradually worsened. Nor did back problems or cancer keep her from participating in life. Juliette did not let these obstacles deter her determination to exert herself and to search for “something meaningful” to do with her life. Juliette developed a lifetime interest in the arts. She wrote poems; sketched, wrote and acted in plays and even became a skilled painter and sculptor, all this while enjoying the social benefits afforded a privileged young woman of Gilded Age. Her horizons were broadened when she married William Low, an Englishman and the couple moved to England. Unfortunately, the marriage disintegrated and divorce was eminent. Taking herself on a world tour, she settled in Paris to pursue her interest in sculpture. However, the hand of fate had other plans for Juliette. Her search for “something meaningful” ended when she met Sir Robert (later Lord) Baden-Powell, a former English General and war hero, who started the Boy Scout movement in 1908 and Girl Guides in 1910. Sir Baden-Powell and his sister Agnes had a tremendous impact on Juliette and the new youth movement. 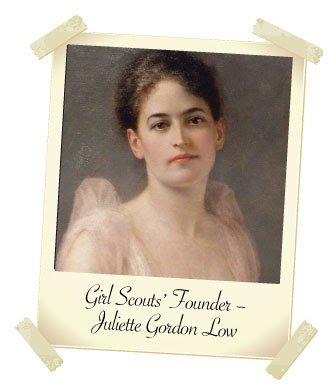 This movement was exactly what Juliette Gordon Low had been searching for. She realized that young women in the United States were missing a wonderful opportunity. When she returned to Savannah she immediately called a friend (a distant cousin, saying, “I’ve got something for the girls of Savannah, and all of America, and the entire world, and we’re going to start it tonight.” On March 12, 1912, Juliette gathered eighteen girls to register the first troop of American Girl Guides, which was renamed the Girl Scouts the following year. One need only recall that the significance of the inauguration of the Girl Scouts in 1912 had wide significance as it was a time when young girls’ education as well as their futures were limited. An organization such as the Girl Scouts was especially important as it fostered and nurtured the development of a new, stronger and motivated young woman determined to succeed beyond the restraints of society. This was clearly evident when World War I loomed that women realized that their role was a vital one in which they would participate as value citizens. This was the beginning of youth movement or a youth quake that permeated throughout the world. The Girl Scouts is the largest educational organization for girls in the world and has influenced the more that 50 million girls and women who have belonged to it. GSUSA uses the Scout principles developed by Sir Robert Baden-Powell to build self-esteem and to teach values such as honesty, fairness, courage, compassion, character, sisterhood, confidence, and citizenship through activities including camping, community service, learning first aid, and earning numerous badges by acquiring other practical skills. Girl Scouts welcome girls with disabilities at a time when they were excluded from many other activities. This idea was an original by Juliette, who suffered debilitating deafness, back problems and cancer in her lifetime. When she died on January 18, 1927, Juliette Low had inspired the founding of the Juliette Low World Friendship Fund. This organization uses it money to send American girls to other countries and to bring other girls to visit the United States. Dear Clara Barton: A gift to your parents Stephen and Sarah Barton, you were born on Christmas Day in 1821. 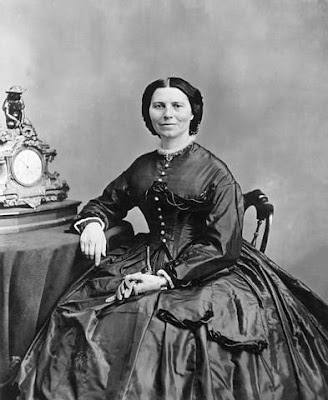 On that day the world was introduced to Clarissa Harlow “Clara” Barton the youngest of five children, a female who would turn out to become a highly influential woman during her lifetime as a teacher, nurse, activist and humanitarian, but best remembered for founding the American Red Cross. Clara was a true pioneer, a woman determined to succeed beyond the call of duty in times of war and in times of peace, which made her a symbol of profound humanitarianism. She is honored as one of the great women of America. After teaching for over 18 years and establishing a free public school in New Jersey, in the mid-1850s Clara moved to Washington D. C., to work as a copy clerk in the U.S. Patent Office. She was the first woman in the United States to hold such a government appointment. Soon after the outbreak of the Civil war, Clara’s was in Washington when the first units of federal troops poured into the city in 1861. Some were wounded, some hungry and some without clothing except for what they had on their backs. Not content to sit on the sidelines, Clara decided to work to provide supplies for the wounded and sick soldiers. She served as an independent nurse and gained support of the generals to travel to battle sites to distribute much need supplies and to tend to the needs of the soldiers. After the war ended in 1865, Clara worked for the War Department helping to reunite missing soldiers with their families. She also became a lecturer that crowds attended, eager as they were to hear about her war experiences. While visiting Europe on a much need rest cure, Clara again could not sit by the sidelines, and volunteered with The International Red Cross during the Franco-Prussian War of 1870-1871. She knew the needs of war and went to the war zone to begin distributing relief supplies to the destitute in the conquered cities. To identify with the International Red Cross she used a red ribbon and made a cross to pin on her coat which became the first Red Cross symbol. The Swiss-inspired International Red Cross led to an American branch. Spearheaded by Clara Barton The American Red Cross was founded in Washington D. C. on May 21, 1881 and Barton served as its first president. Much to her credit she never took a salary from the organization and sometimes used her funds to support relief efforts. After years of service she retired in 1904. However she remained active, giving speeches and lectures and died at her home April 12, 1912. By Clara Barton's words and her actions she is honored as a great American heroine who created The American Red Cross, an organization that still aids victims of natural disasters today. Dear Emily: Who would have imagined that Emily Price, a fashionable Victorian young woman, who seemingly held the elite world of the Gilded Age in her hands, might have had any other thought in her head than to get married and spend more and more time in society. Emily, born in 1872, was the only daughter of Bruce Price, the architect and planner of Pierre Lorillard’s Tuxedo Park, an exclusive country resort which opened in May 1884 to fanfare and anticipation. It inaugurated an era of social propriety in the rich and fashionable world in which Emily lived. The independent, planned, carefully screened community housed the social elite at a time when manners were tantamount to participating in polite society. Emily always behaved correctly and knew what was expected of her. With her beauty, fine breeding and wit she was destined to become a woman determined to succeed in the role that she would later assume as an arbiter of manners. Educated by governesses and at Miss Graham’s finishing school on West Twelfth Street in New York, Emily was trained on the dictum that a lady always, at all times, under all circumstances, lives up to what is expected of a lady. She lived up to Miss Graham’s expectations and attended a ball in one of Fifth Avenue’s elegant mansions and met a prominent banker named Edwin Main Post, her husband-to-be. Following a fashionable wedding in 1892 and a honeymoon tour of the Continent Mrs. Edwin Post’s first home was in New York’s Washington Square. The couple had two sons, Edwin Main Post, Jr. (1893) and Bruce Price Post (1895). Emily had had little time to think of herself and in a world so carefully orchestrated she found herself wondering how much of her life was habit and what proportion of her social behavior was a sincere expression of her own feelings. Sitting for her portrait to be painted by Rosina Emmet Sherwood, Emily was asked, “What do you do with yourself?” Emily told the portraitist the usual. Balls, dinners, receptions, calls. A coaching party. A weekend house party at Rhinebeck. Being bridesmaid at a friend’s wedding. Tuxedo as soon as May made the country endurable. Emily observed something unusual about Mrs. Sherwood. She had at least one small child and was soon to have another, but this did not appear to be hindering her career. She was the first professional woman Emily had known, a woman who combined marriage, motherhood and a career. This encounter was the stirring pot of Emily’s realization that she was living in a dream world and that like Mrs. Sherwood there was potential for her to pursue another avenue for her creativity, which early on she had exhibited as a writer. On the first of November everyone who was anyone of social note came back to town. Besides and big parties, there were small dinner parties, the Horse Show, the smart weddings, and balls to attend. It would be rare for the couple to dine alone together, without guests. Further abetting this fact in accordance with Edwin Post’s view of marriage, he and Emily would be spending less and less time together, and after the preliminaries of establishing a proper family were accomplished he would spend more and more time in Society. In this regard, the Posts were no different than other couples in their set. However, Emily realized that her husband was as much a stranger to her as she was to him. The couple divorced in 1905, because of Edwin’s affairs with chorus girls and fledgling actresses, which had made him a target of blackmail. When her two sons were old enough to attend boarding school, Emily turned her attention to writing. She produced newspaper articles on architecture and interior design. 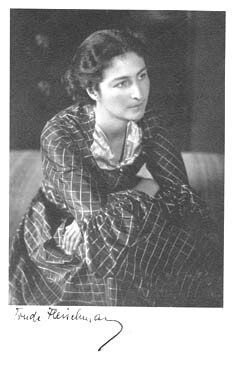 Her romantic stories of European and American Society were serialized in several popular magazines including Harper’s, Scribner’s, and The Century, as well as light novels, including Flight of the Moth, Purple and Fine Linen, Woven Tapestry to name a few. Her writing was diversified, including humorous travel books and she even became a ‘traveling correspondent.’ The recognition that would afford Emily her greatest fame was writing about etiquette, a subject on which anyone interested in participating in polite society sorely needed advice. After publication in 1922, her book Etiquette (full title Etiquette in Society, in Business, in Politics and at Home) was a best seller, the phrase “according to Emily Post” soon entered our language as the last world on social conduct. It was a best seller, and updated versions continued to be popular for decades. Mrs. Post, who as a young woman had been told that well-bred women cannot work, was suddenly a celebrity, a woman determined to succeed, an outstanding career woman. 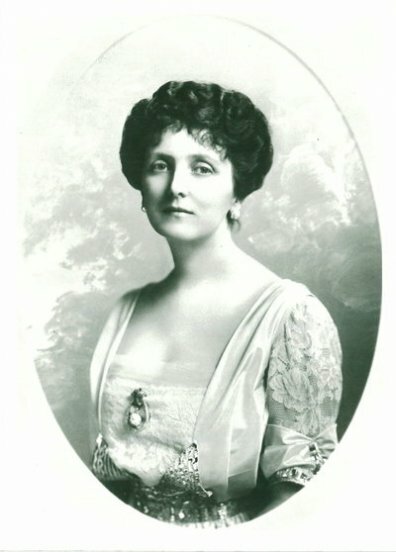 Her numerous books, a syndicated newspaper column on good taste for the Bell Syndicate, and a regular network radio program made Emily Post a figure of national stature and importance. IN 1946, SHE FOUNDED THE EMILY POST INSTITUTE WHICH CONTINUES HER WORK. She died in 1960.